Paulist Fr. Eric Andrews has been president of the Paulist Fathers since May, 2014. Fr. Eric previously served as president of Paulist Productions, our community's film and television production house, from 2009 to 2014. 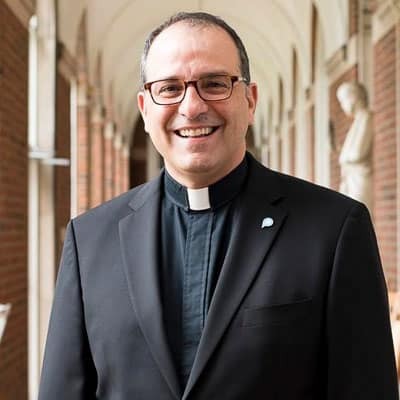 Prior to that, he spent several years in Knoxville, Tennessee, where he was pastor and associate pastor of St. John XXIII University Parish at the University of Tennesee, as well as superior of the Paulist Fathers in that city. Ordained on May 13, 1995, Fr. Eric served early in his priesthood as associate pastor of our mother church, the Church of St. Paul the Apostle in New York City, and as part of the team at Paulist Media Works in Washington, D.C. He also spent seven years as a member of the Paulist Fathers General Council. Prior to entering our novitiate, Fr. Eric was a junior producer at The Jim Henson Company. A native of the Hudson Valley, he is a graduate of New York University's Tisch School of the Arts where he studied film and television production. While he was a student, he was active at the Catholic Center at NYU. Fr. Eric lives at our motherhouse in New York City. You can find Fr. Eric on Facebook, Twitter, Instagram and Pinterest.